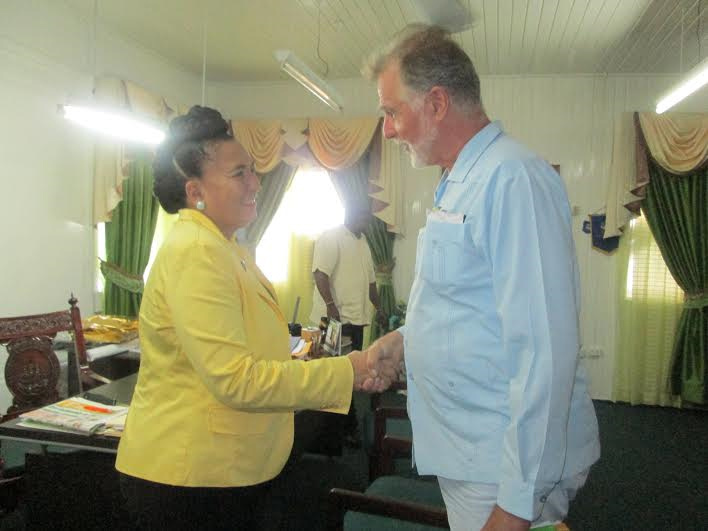 Germany’s Ambassador to Guyana Lutz Hermann Görgens last week signalled his country’s interest in providing technical support to the Georgetown Municipality in the areas of renewable energy and special training opportunities, during a courtesy call on Mayor Patricia Chase-Green. According to a press release, Görgens disclosed that the German embassy is willing to collaborate with the Georgetown City Council in special areas. He lauded the commitment to return the city to its ‘garden city’ status adding that the changes in the environment were evident. Mayor Patricia Chase-Green and German Ambassador Lutz Hermann Görgens meet in the mayor’s office. Chase-Green welcomed the offer and expressed a willingness to work along with the embassy. The release said Chase-Green noted that the two nations established formal diplomatic relations in September 1966 and have collaborated in a number of areas, particularly forest preservation and climate change. Town Clerk Royston King noted that the council is not only restoring the environment through rigorous cleaning, but also promoting the green city concept which includes efficient solid waste management, promoting environmental awareness and education, encouraging the use of solar energy, examining climate change and its impact on the city and urban forestation, the release said.